That quote is an oldie, but I still love it because it’s so true. Most parents I know feel a need to punish their kids for doing something wrong. Punitive measures tend to make children feel embarrassed and angry and when they feel that way, their desire to cooperate will be much less. For example, they have a bad day at school, we want to immediately punish them, in part, because we’re mad and embarrassed about it. So before thinking it through, we might take away computer privileges when they get home. We believe that simply by punishing our children for misbehaving they won’t make the same mistake again. Unfortunately, it doesn’t work that way. Let’s clarify the difference between discipline and punishment. Many parents get confused with the two. They say “I’m going to discipline her” when what they’re really meaning is “I’m going to make her pay for this.” That is punishment. Discipline is not punishment. They are two totally different things. 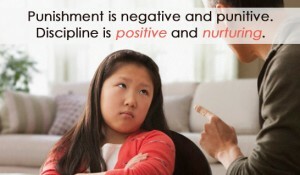 Punishment is negative and punitive. It makes them suffer for their wrongdoing and focuses on parental control. That is called external locus of control. This control causes children to respond in a defensive way. Punishment focuses on the wrongs and breeds hostility and frustration in both parent and child. Punishment shames and usually doesn’t work. Then, when it fails, we’ve got frustrated parents. That only escalates their need to work harder to get their child under their control. Healthy parents do not want to control their children. themselves so they can be self-regulated. We allow them to own their problem and figure out ways to solve it. Discipline is teaching children how we expect them to behave, in other words, guiding them. It is something you do with, not to your child. Discipline creates an attitude of concern on the parent’s part. Kids usually respond to that attitude and want to change their behavior. 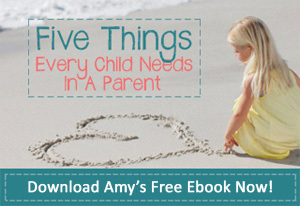 To be effective disciplinarians, a strong parent-child relationship must be in place — a relationship where the child feels connected and loved unconditionally. When children are connected in this way, they usually want to act right and do what is right. After you are certain the parent-child relationship is solid, look at yourself. Are you leading by example? In other words, are you behaving the way you want them to behave? Surprisingly, many parents do not. So many of us expect our children to be what we are not. It is a mistake to expect our children’s behavior to change without changing ours. It’s unfair too. The more positive we can be, the better. Focus on what your child is doing right, not what he is doing wrong. Catch them being good. To validate positive behavior, high five them, hug them or even notice what they’ve done by expressing it verbally. Try to get to the root of the misbehavior. Are they mad at us? Did they have a fight with a friend? Did they have to go to the principal’s office and are afraid to tell us? Sometimes they just don’t have the words to tell us what they are feeling. Why not begin to consider yourself a guide, much like a shepherd? They gently guided and lead the flock. Intentional parents walk beside, instructing, inspiring and encouraging but never provoking or bullying. Remember, from here on out, that the parent-child relationship is your secret weapon in effective discipline.